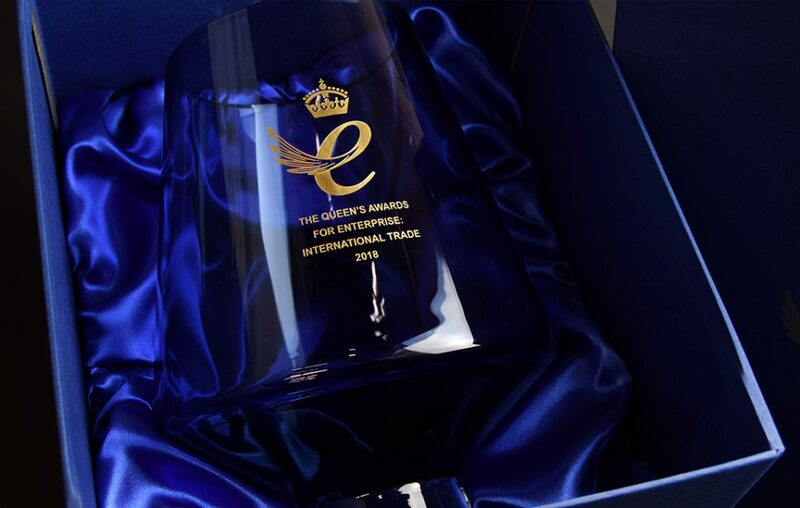 THE Queen’s Award for Enterprise is one of the highest accolades for business success in the UK. It must be on the wish list for every Made in Britain member, to achieve the recognition a Queen’s Award brings. 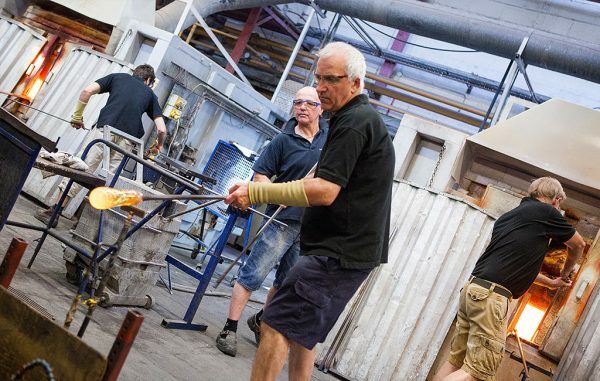 Made in Britain is delighted this prestigous award is made by Made in Britain member, Dartington Crystal. Dartington Crystal won the contract for the 2nd time in early 2017 for the 2017 - 2019 business. Hilary Green opted for a transparent ink blue crystal to complement the rich blue that represents the Queen’s Award corporate identity. The deep bowl is designed to be robust and sturdy while maintaining a look of elegance. The walls taper inwards to best present the engraved emblem and text to the viewer. Each piece is finished with a solid clear crystal pedestal base for stability, making the award easy to hold during photo opportunities and presentations. The item is hand-made from 24 per cent lead, mouth-blown crystal at Dartington’s factory in North Devon using a method called colour casing to give the glass that deep blue hue. The ink blue crystal is made using a recipe developed by Dartington’s own glass technician and features cobalt as a key ingredient. A small amount of ink blue crystal is gathered from the furnace to form the initial bubble at the end of the blowing pipe. This is cooled enough to keep its form while a thick layer of clear crystal is gathered over the top. By colouring the inside skin only, the award appears gently transparent. 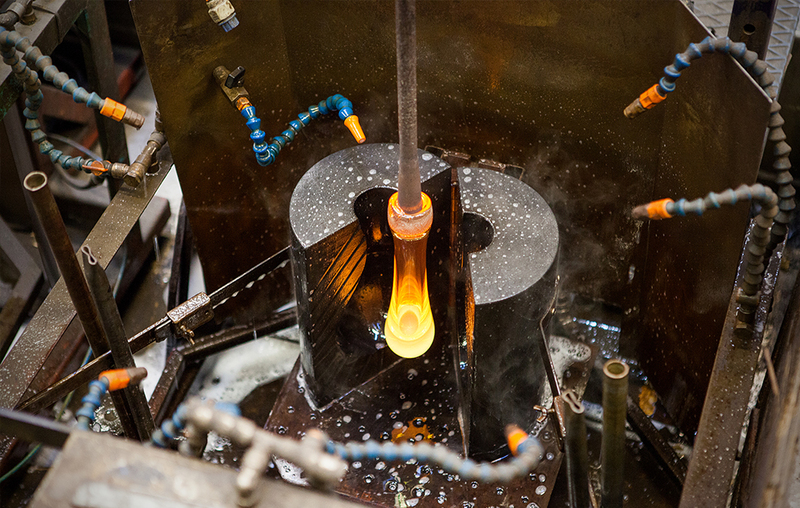 The large double layered molten glass bubble is then blown into the graphite mould to shape the deep trophy bowl. Such a beautifully crafted piece needs only a little decoration to complete the design. 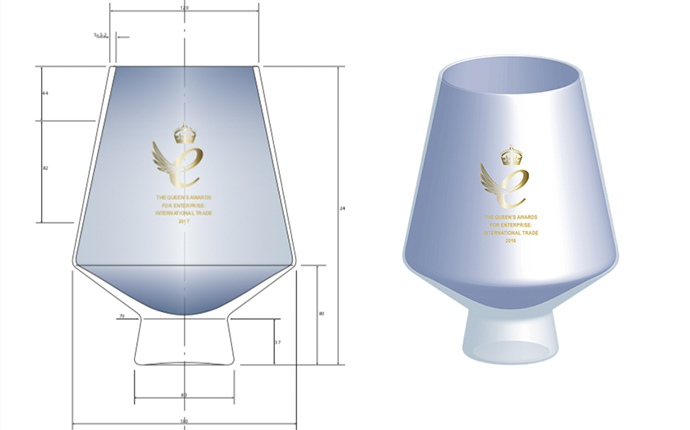 The Queen’s Award emblem and the award category are added using a hand-applied stencil, which is then etched with fine sand. The etched finish on the surface is then filled with hand-applied gilding. Finally, the award is packaged in a silk-lined presentation box to perfectly frame the piece. Recipients are recommended by the prime minister before being approved by the Queen. This royal seal of approval allows businesses to fly the Queen’s Award flag at their premises and use their emblem throughout their marketing, helping them to increase their commercial value and gain worldwide recognition. Winners are usually announced in April and invited to attend a royal reception. The commemorative crystal award and a Grant of Appointment are later presented at the winners’ premises by one of The Queen’s representatives, a Lord-Lieutenant. Some of our members were lucky to win the award in 2017/2018; Activinsights, Hanningfield, Ecotile. Will any other members of Made in Britain be proudly associated with the trophy next year? Let’s hope so!